In most industries, participants are supported by trade bodies who champion their cause, finding common ground between companies who might otherwise be rivals. By encouraging members to share their concerns and frustrations, trade bodies are able to constantly refine best practice and lobby external parties to protect members’ interests. Education is a key element in this process. The UK’s advertisers are extremely fortunate to have ISBA on their side, supporting the sector in discussions with government, regulatory bodies and the supply chain. In this last area, balanced and fair relationships with agencies are paramount. Financial transparency is vital especially in opaque spend categories such as music. Against this backdrop it’s been my privilege to support ISBA over several years through written guidance and member presentations, particularly to their Communications Procurement Action Group (COMPAG). You can see the latest presentation HERE from late November 2018. 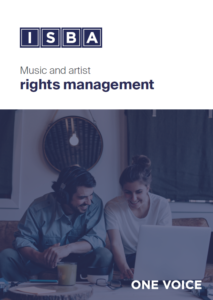 Most recently, ISBA has launched the latest guidance note on Music and Artist Rights Management. This document covers recent developments within the music industry which impacts advertisers’ transactions with rights owners and talent. Like Talent and Photography, the negotiation of music rights is a complex and ever-changing landscape within which advertisers need to know the right questions to ask their agencies. If your company is an ISBA member, you should already have received your copy of Music and Artists Right Management. More can be obtained from Traci Dunne TraciD@isba.org.uk. If your company is not an ISBA member, I recommend that you consider joining. More information is available HERE. Prev prev postPrevious page What’s The Weather?